St Francis Animal Rescue is delighted to announce that Gaynor Young will be speaking on behalf of their charity at The Links Clubhouse on Monday 22nd April, at 10.00 am. Most will remember Gaynor as the actress who survived a near-fatal 18 metre plunge down a stage lift shaft at the State Theatre in Pretoria in 1989. At that time, Gaynor was a rising star in the theatre but her career was cruelly cut short when she fell five storeys during a scene-change during a performance of Camelot. Gaynor suffered multiple fractures and brain damage including the loss of 98% of her hearing, most of her sight and mobility on the right side of her body. According to reports at that time, she spent five weeks in a coma and received intensive therapy for years, learning to walk, talk and eat unaided. After 18 years of being deaf, she got her hearing back through cochlear implants. She currently has only 40% eye-sight but claims she sees “so much beauty that others often miss”. The woman who specialists feared would never be able to do anything again, won the South African Blog of the Year award in 2015 – plus she has been back on stage, performing in two one-woman shows. Not only has Gaynor recovered to the point of independence, she spends a large part of her ‘new life’ motivating others through her blog, books, shows and talks. Don’t miss hearing Gaynor Young’s hugely inspirational talk about her life on Easter Family Day. Bring friends, bring family and come and join us in celebrating life! Tickets are selling now at Kouga Print and Toffee Clothing for R150 each. All proceeds from Gaynor’s talk go towards our ‘Open Your Eyes & Sterilize’ campaign and our feeding and medical treatment programs for the cats and dogs of Sea Vista. The following set of photos graphically illustrates some of the worst traits in humans, and I for one hang my head in shame at our irresponsibility, and the knock-on effects to wildlife that we profess to care for. How have we become insensitive to our surroundings? In this case, the blame for discarded fishing line lies squarely at the feet of fishermen. Not all fishermen behave irresponsibly of course, I have friends who are keen fishermen & I know they act very responsibly and would never discard a single matchstick at the water’s edge, let alone bunches of discarded fishing line. Sadly however, and judging by the amount of fishing line that one sees lying around on the margins of dams and along beaches, the majority of fishermen seem to have no concern for the way they litter! 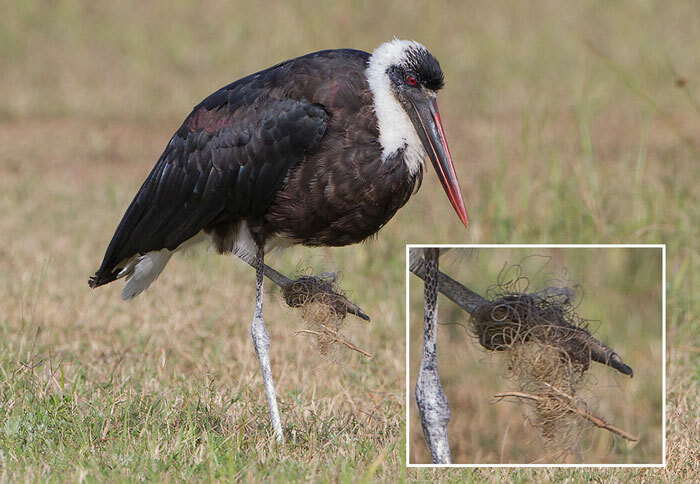 All the photos below show fishing line injuries to three separate Woolly-necked Storks. Stork Nos 1 & 2 photographed at Albert Falls Dam near Pietermaritzburg (March, 2019), and Stork No 3, photographed at Mtunzini, June, 2014. Stork No 1 with left foot entangled in fishing line. When storks become entangled in fishing line, the line often becomes tight, stopping the flow of blood, resulting in swelling and eventually foot or toe loss. This also means that the entangled birds can no longer roost on tree branches at night as they no longer have the capability to clasp onto the branch when the wind blows. Stork No 1, with the right foot showing stump-end & loss of toes from a previous (healed) fishing line injury. Left foot now undergoing similar constriction and potential further loss of toes. Stork No 1 attempting to find aquatic prey along the shallow margins of Albert Falls Dam. Stork No 1 in flight. A woolly-necked Stork on the edge of Albert Falls Dam, completely oblivious to the danger of fishing line just one meter behind where it is standing! Stork No 2. Within minutes of photographing the first Woolly-necked Stork entangled with fishing line, a second bird was seen limping badly with a swollen toe dangling and about to fall off! Stork No 3. This bird, in obvious pain, was found limping badly at the edge of the Umlalazi Lagoon, Mtunzini. Umlalazi Nature Reserve is managed by Ezemvelo. Msinsi Holdings manage the Albert Falls and Midmar Dam resorts, and do a good job of running these facilities. However, there should be more accountability with not only keeping water margins clean of debris, but also signage to alert and educate fishermen re the dangers of items such as discarded fishing line. Although this article was written some time back in a place a thousand kilometres from St Francis it is just as relevant here as there, for our birdlife, and indeed sea life is equally threatened by not only the nylon of fishing lines but also the hooks, sinkers and of course the plastic that pollutes our coastline. Fishermen are urged to act more responsibly, both along coastal shore lines and at inland fishing sites.